Jin-mei has grown up in a magistrate's home in 9th century China, and is expected to marry well and be a proper bride. She's known of Bao Yang since she was young, admired him from afar, and anticipates their wedding. She doesn't realize she's been deceived until she see the "ghost" of her husband days after being told he was murdered. 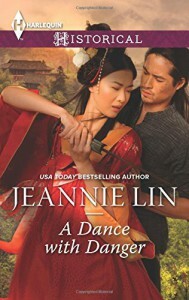 A Dance With Danger takes Bao Yang and his determined wife across China as they hide from the people who want him dead, while he seeks revenge for his wronged family. It's a beautifully written story with strong characters, unlike any historical romance I've read. I'd always heard good things about Jeannie Lin and am glad to have started with this book.